We should remember the past, lest. . . If it were a fad, you wouldn't be reading about it right now. Dungeons & Dragons was always a fast starter. The first printing of 1,000 copies were gone in just a few months. That print run was doubled and sold out even faster the second time. The popularity was synergistic. Due to a mixup with rights involving The Hobbit and Lord of the Rings—Donald Wollheim of Ace Paperback was upset because Tolkien snubbed him when he asked to print Hobbit and Lord of the Rings in paperback. When their limited 5 year license to print them ran out, he just decided that it was public domain and began publishing it illegally. In order to stop this, in the late 60's they ran a huge publishing campaign to assert their rights in the united states, making the lord of the rings a very popular book in the early 70's. The themes in the book and the rising counterculture of the time made the seminal fantasy novel a nationwide phenomenon. A lot of that popularity contributed to the fast success of Dungeons and Dragons, which in turn began to spawn more fantasy novels. With distribution channels in bookstores, gas stations, sears, and cheap child friendly books (Moldvay/Cook and Mentzer Basic) along with ads in boy's life and other teenage magazines, it sold millions of copies. 12.9$ million dollars worth in 1981—That's almost 50 million dollars in 2019 money. It was the first D&D boom, and for many years, was the largest. One of the reasons Dungeons and Dragons was able to get into so many distribution channels is that they were sitting on a large pile of money, and therefore willing to take the risk of distributing to bookstores. If a book didn't sell, you could return the cover for your money back. Once control of the game was wrested away from the Gygax family, by the selfish and despicable Blume brothers, everything changed. No longer were they interested in employee feedback. Through a series of poor business decisions, and a rumor of a large stock of suddenly returned books (from Sears, iirc.) in the late 90's, Dungeons & Dragons found itself solidly in the red. But like anything wonderful and good that asks nothing of the world, people remember and give back. 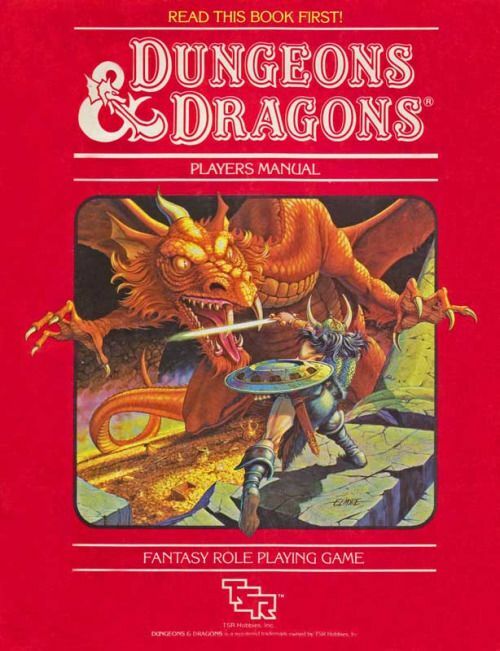 Turns out, Dungeons and Dragons was a fan favorite, A long time player and creator of a cardboard based drug that prints money, Richard Garfield, decided Wizards of the Coast would purchase D&D. They did so, changed the corporate environment, immediately made a series of good business decisions and began to work on 3rd edition Dungeons and Dragons. Third edition is coming. . . . In the late 90's Dungeons and Dragons was dead. In addition to releasing more and more tone-deaf supplements that sold worse and worse, modern gamers had made all their complaints about Dungeons and Dragons that weren't understood by the gaming public. They had grown up with Dungeons and Dragons, and everyone had moved to the more mature and adult role playing game "Vampire: The Masquerade". In addition to being a bizarre synthesis of of the most overbearing aspects of 'narrative second edition play' (i.e. illusionism, or railroading), it also had a cool cache, and it was a fair sight easier to hook up after a vampire game then the nerdy Dungeons and Dragons. But in late 1998, rumors began—a new edition of Dungeons and Dragons? I perused the neophyte site EN world sometimes more than one time a day for details. Nothing lasts forever. . .
Fourth edition was eventually announced. The game had become weighty and the people that played online spent their wrath in character optimization boards arguing endless spherical cows. Adikson had left, the D20 glut had gutted sales, and it was time to move forward. A new game was designed, creating lists of powers—with copyrightable names, of course—and planned integration with online tools. Unpopular races like gnomes were removed, and tieflings and dragonborn were made core (because people really like playing half-demons and dragon/lizard people. It's a fetish.) Since people were playing it like a tactics game, they designed it like one. Healing surges, powers with cooldowns, and more. Many people would say that it was disconnected rules or that the change was too radical. I don't think that's true. I wasn't excited about 4th edition, but I played it, a lot. It was just really bad. Even when they tried to correct it later in official materials, it was too little, too late. Combats with creatures or opponents with hundreds of hit points, exhaust all your powers (which were printed on cards), and then left with each person doing their damage or missing to chip away at the ridiculous hit point totals. It was not a fast process, and in fact during one combat, I just went ahead and calculated our average damage per round and figured out, on average, how many rounds it would take to deplete the boss's hit points. The Dungeon Master, campaign setting, and all the rest was fine. I was playing with reasonable people, we just kept having. . . problems. I had a lazer that blew things up because that's something paladins could do in fourth edition. But you couldn't shoot anything that wasn't an enemy in combat There were issues with skill challenges (understatement) and thinking through the effects on the spell list created an untenable reality. In the first printing, speak with dead allowed the caster to communicate with anything that had died in the area, no matter how long ago. Basically there were a million undead in a sensor network that any mage could take ten minutes to ask a question. Strangeness abounded; poorly thought out design lead to the games eventual doom, but it wasn't the only nail in the coffin. That wasn't the worst news to come out of the 4th edition debacle. Originally their marketing plan was to distribute "patches" to the ruleset and require a paid subscription to an online tool to create characters. The rules were designed to be integrated into a true virtual table top that would allow play in much the way modern virtual table tops such as Fantasy Grounds do. Sadly, the direct of the project suffered a breakdown when his wife filed for divorce, and he killed her, then himself. I doubt it would have changed anything in regards to 4th edition but it never even had a chance after the virtual table top plan collapsed. Though the most famous Dungeons and Dragons news story of all time, has to be the Patricia Pulling story. Very simply put, she had a bright intelligent son, who suffered from a psychotic break. He began barking and acting like a wolf, killing animals in their backyard. He soon committed suicide. Ms. Pulling claimed that her son died because of a Dungeons and Dragons curse. She brought lawsuits against his school, TSR inc, and more. They were thrown out of court for being meritless. She then began a campaign of lies and disinformation that lasted years. She was a confused angry lady. She once claimed that 8% of people were satan worshipers because she estimated 4% of kids were and 4% of adults were and if you add them together you get 8%. When it was pointed out to her that this isn't how math works—not even addressing her claim is a made up estimate—she said it didn't matter because 8% of everyone being a satan worshiper was a conservative estimate. Her organization, Bothered about Dungeons and Dragons, died out when she did, in 1997, but the world had moved on in 1990. Today Dungeons and Dragons is riding the wave of popular culture, and hopefully will be producing rich fantasy worlds for generations to come. Oh my goodness. The above was a misclick. Scott Anderson was kind enough to point out I misspelled Blume Brothers as Bloom Brothers, and I was trying to thank him and accidentally removed his comment. There isn't an undo. It was pleasant and removing it was completely accidental. Thank you Scott, I've fixed it in the blog post. I remember EN World! I had a subscription or whatever the paying option was after while, I on there for so much! Yeah, I'm pretty sure we talked. Courtney, I recently saw your interview with Matt Finch on youtube and I wanted to mention how inspirational I found it, particularly your brief discussion of ttrpgs as shared vision quests or dream quests. I wonder if you will go into further detail on this subject in future blog posts or interviews? It seems to me that what you described as creating a consensus on the facts of the shared fiction (apologies if I butchered your words there) could be an extremely powerful bonding element. I don't know much of anything myself about how native American cultures used vision quests other than a brief look at Wikipedia, but I am interested in whether there is something universal there. In any case, I want to thank you for the thought you put into your work and for maintaining an empathetic stance as a GM. You should add an "archive" menu to the blog. It really makes it easier to navigate through old posts chronologically, specially when you're searching for something specific. There's an index tab and a search bar in the upper left.